Oklahoma women’s basketball landed at No. 16 in the preseason Associated Press Top 25 Poll. 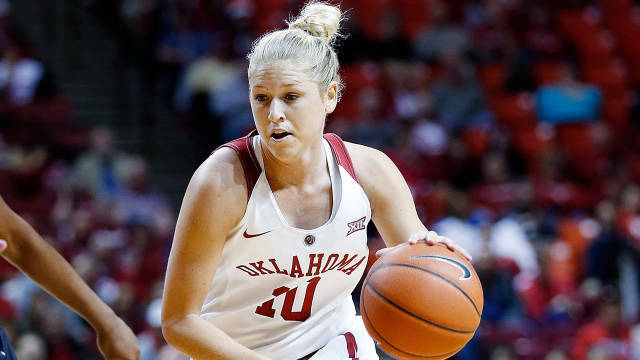 Oklahoma returns four starters and 12 letterwinners from last year’s squad that advanced to the second round of the NCAA Tournament. The ranking for the Sooners marks the 20th consecutive week that OU has appeared in the AP Poll. Notre Dame (14 first-place votes) was selected No. 1 followed by Baylor (12 first-place votes), Connecticut (six first-place votes), South Carolina (first-place vote), and Louisville. Maryland, Ohio State, Texas, UCLA and Mississippi State round out the top 10. The Sooners return a majority of it production in every statistical category for the 2016-17 season. That includes 82 percent of their scoring and rebounding along with 94 percent of their assists. OU also brings back 100 percent of its 3-point field goal production from a year ago. The Oklahoma women’s basketball team enters the 2016-17 season ranked No. 18 in the preseason USA Today Top 25 Coaches Poll. The Sooners are one of four Big 12 teams that appear in the top 25. Fellow league foes Baylor (No. 4), Texas (No. 6) and West Virginia (No.25) are ranked inside the top 25 to begin the year. Oklahoma State also received votes in the preseason poll. The ranking marks the 16th all-time appearance for the Sooners in the preseason coaches poll under head coach Sherri Coale. OU was also tabbed No. 18 to begin the 2015-16 season. The Sooners return four starters and 12 letterwinners from last year’s squad that finished with a 22-11 overall record, advancing to the second round of the NCAA Tournament. 2016 All-Big 12 Preseason honorable mention selections Peyton Little and Vionise Pierre-Louis lead an experienced squad into the 2016-17 season. Connecticut was selected No. 1 in the preseason poll followed by Notre Dame, South Carolina, Baylor and Maryland. Ohio State, Texas, Louisville, UCLA and Stanford round out the top 10. Five of OU’s non-conference opponents are ranked or receiving votes in the preseason poll: BYU (RV), California (RV), Colorado State (RV), Kentucky (No. 19) and South Dakota State (RV). OU’s regular-season opener is set for Nov. 13 at 12:30 p.m. versus Southern Illinois.